CLEVELAND, OHIO – Code Pink activist Medea Benjamin won’t condemn Black Bloc demonstrators who threatened a female reporter on the streets of Cleveland. Benjamin and her group were doing a street theater protest at the exit of the Republican National Convention Tuesday evening when this reporter approached and asked her how she felt about the anarchist Black Block threatening a female reporter Monday night. 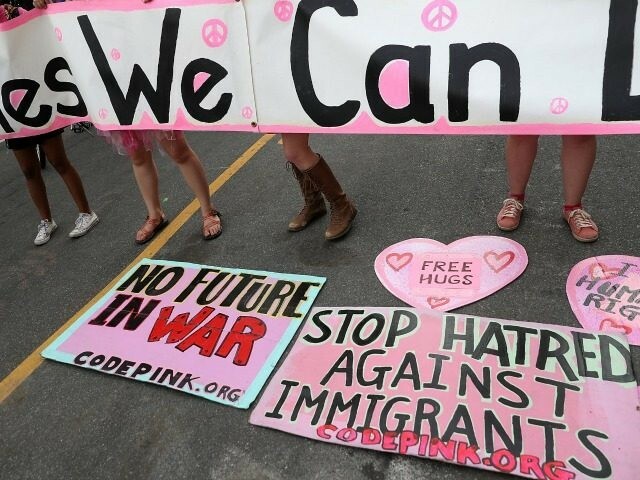 As reported earlier, Code Pink was part of a march that included the Black Bloc. On the other hand, fellow Code Pink activist division Jodie Evans at first denied that such a threat had taken place and said the purpose of the march was “hugging,” but when informed by this reporter that he had personally witnessed the threat, Evans condemned it. Protests heated up Tuesday after a relatively quiet day Monday and are expected to continue throughout the week.